To Live is to Love is to Hate. Have you ever stood in front of a painting, turned the pages of the latest hot novel, or sat in an audience at Carnegie Hall, experiencing a conflicting mix of feelings, where both love and hate, create a toxic mix of ambivalent emotions as you looked, read, listened? The renowned writer and author, Herman Melville said ” indifference is opposite of love, not hate. Hating art is like loving art.” It’s the same extreme emotion projected in a an upside down way. That’s the way it’s supposed to be. You are Not supposed to be 100% clear while engaging in any artistic experience because that would be kind of boring? Right? Nobody wants it 100%. Yes or No. Easy to figure out. Mystery is key. A mixture of things to both love AND hate make it interesting, fun, edgy, create a story, spark our curiosity, essentially involving us like nothing else does. The yin and the yang forces necessary to life’s evolvement. And that is not a simple thing. It’s a bit of black and white, yes and no, up and down, that forces us to really get into it and feel the love/hate dichotomy that riles people up, makes them sweat, and sends them running to their therapists! Otherwise, what have you? Flat – lining into oblivion. “Dead Man Walking.” And who wants that?!??! We need to have that duality when engaging in whatever our art crush happens to be. Otherwise it’s easy to take it for granted, get bored, and loose interest. Not Cool! Falling in love with a painting, a song, a poem, a story, a film, a dance, can feel like a powerful emotional rush, driving the need to engage in an extreme relationship with the object of your infatuation! The reason someone will pay 20 million$ for a painting, or develop a cultish obsession for a writer, I’m thinking about David Foster Wallace, Jack Kerouac, Hunter S. Thompson, for example, not to mention the obsessive crushes people get on rock stars and actors, creating fan clubs, on-line sites, stalkers, venting their obsessive emotions, that are indulged and stoked by the Technicolor images on stage and screen. The passions that the Beatles, the Stones, Elvis, Michael Jackson, Nirvana ,inspired in the past, certainly looked like love! Swooning teenagers screaming in the audiences, universally tells the story. The Love Story. But then, flip the switch, and you get Hate. The fine line, tightrope walk where Love & Hate get uncomfortably close in their emotional energy and feeling. 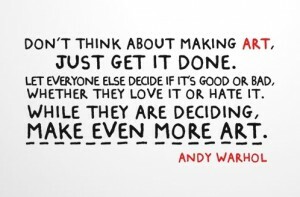 Especially when it comes to art. The hatred of an artwork, can be as emotionally charged if not more so as the love of it. Both require intensity of feeling. 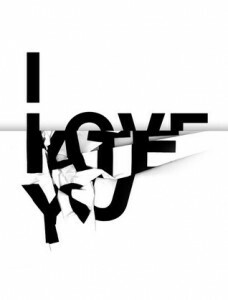 Hating & Loving, the dynamic duo, blending as one, a bipolar emotional cocktail, with the ultimate result being a feeling of Something whether —viewing, reading, writing, listening, thinking……. Superman & Batman jumping the Shark! Depending on who you are either poem has the possibility of evoking either Love OR Hate, as the poem is processed emotionally in that unique experience that art gives us. One’s identity confirms and affirms one’s feeling. 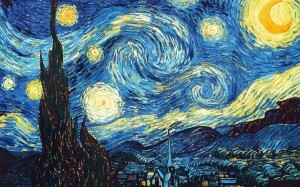 The large crowd always clustered around Van Gogh’s “Starry Night” masterpiece at the Metropolitan Museum in NYC, can’t stop staring, at the mesmeric swirls of color as they click click click on their iPhone cameras trying to preserve the memory of this work of art that is so hard to walk away from. 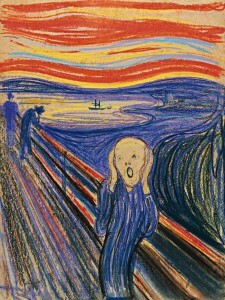 The agony depicted in Munch’s “Scream” is paltable, it is cringe worthy at best. Hate or Love? I call hate on this one. It’s definitely not a pretty warm and fuzzy moment. “Scream” makes you want to cry and run away. But that’s great. It’s emotion. And that is a good thing when delving into arts’ caverns of love and hate. You will find both, living side by side, in harmony conflict. A duo of opposites. Revealing the dichotomy of life forces as experience teaches the individual as he grows. 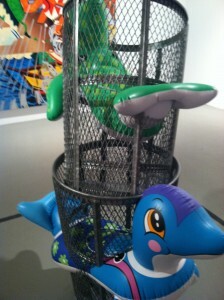 Pop art will inspire a lot of hate, as Jeff Koons did with me at his latest exhibit at the Whitney in Nyc. People Love to Hate Pop. They often don’t get it so it’s easy to hate. They link the hate often with ridicule and laughter. That’s fine. At least they are feeling something and that’s the point. Warhol’s art was ridiculed and mocked all, over town. That Campbell Soup can was absurd! After all it was just a soup can. Sure. On the surface. Of course ironically, it became the trademark that helped turn Warhol into a pop icon legend, while the haters watched him laugh his way to the bank! So you never know. Hating an art work can be a good thing. 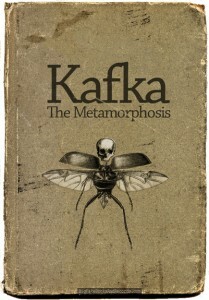 When Kafka’s “Metamorphosis”, was published, people didn’t know what to think! A salesman, his protagonist, turning into a giant insect, with no real explanation, it was so bizarre, so hated, so dark, that of course it became his major work, the novel he is known for, the book on high school reading lists worldwide! The story, brought to the surface dark feelings, and confusing messages, all symptomatic of Kafka’s own personal life story. “A book should serve as the ax for the frozen sea within us” so said Kafka. 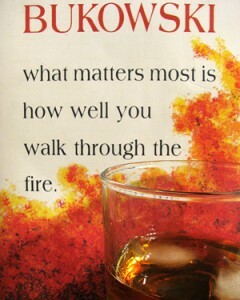 He finished none of his novels and burned 90% of his work. “Metamorphosis” regarded as his seminal work inspire those conflicting love – hate feelings in any reader. His themes of alienation, physical and psychological brutality, quest, and transformation are the substance of his writings, fascinating readers for over 70 years. One can either love, hate, or a combination of both, Kafka’s take on life, and it’s effect on his literary work. But one cannot remain unaffected. One cannot ignore! “Indifference and neglect often do much more damage than outright dislike” JK Rowling. She should know, waiting on the line for her literary blockbuster Harry Potter, to be recognized! If the art has inspired ANYTHING other than indifference it has succeeded in cracking that emotional nut! LOVE. HATE. The mirage where the train tracks appear to join as one in the distance, or the ocean and sky meet at the horizon. 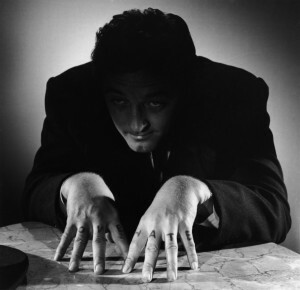 The actor Robert Mitchum, in “Night of the Hunter”, tattooed his knuckles with the words Love and Hate, in the 1955 film. Pulp. Dark. Cool. Unforgettable! Playing a psychotic preacher, he characterized themes of good and evil, as he flashes his knuckles as a trick to seduce women in the towns he visits, a predator using religion, with good and evil symbolism, as his ticket in, his entrance thru the doorways of womens hearts and cash. With the word LOVE, tattooed on one hand, and HATE on the other, he had his unique, convenient, creepy visual to back up his words. The common universal theme of good and evil as combative forces in religion, nature, and art, communicate an emotional feeling unavoidable for most of us. Mitchum, in the film, plays a character who is very aware of this power, and uses it to manipulate his naive victims, who fall for his preacher act, as he spins biblical proverbs while flashing his significantly labeled hands. A predator hunting his prey, using the themes of love and hate as his metaphorical bait! Art can have this kind of power. The viewer, the reader, the listener gets pulled in, on the emotional level that exposes feelings, good and bad, through the magic and mystery of the sublime presence and power that art evokes! Emotional Q or “EQ” dominates and supplements us with an energy like no other! 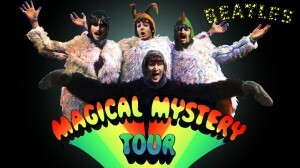 We experience our own version of a “Magical Mystery Tour”, as we visit unexplored artistic regions! Our EQ provides us with the perfect guide, helping expose and enhance our artistic feelings on the journey. We see in the paintings and poetry of the genius William Blake, the spiritual power of his mind, translating, love-hate, good – evil, themes which permeate the great body of his work. Being a metaphysician, an alchemist, a painter, a poet, a printmaker, a visionary: he created his art from a very transcendental place, and it shows. Love. Hate. Blake “GOT” it! Supremely gifted with genius, and possessing a powerful connection to the spiritual world, he combined both painting and prose to transmit his messages to the world. 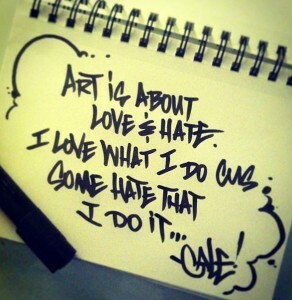 Yes, love and hate dictate the emotional overlap in the art world to the outer world. People being who they are, relationships get messy, and so it is with our relationships with art. Messy. There is rarely a clear definitive response, but when there is, it’s either one or the other. But both are related as the pendulum swings back and forth, like our reactions when faced with the Basquiet, the Lautrec, the monster insect of Kafka’s masterpiece, or the grotesque eviscerations of Francis Bacon’s men, Diane Arbus and her freaks, or Anais Nin’s narcissistic journals, Tennessee William’s anguished characters, Kurt Cobain’s angst ridden songs, Or John Water’s underground film personalities, the list goes on and on and on……. We all participate in the dictatorial symbolism emoting from the very genesis of what art is, and when we engage, by either making art or enjoying art we become the welcome victims indulging this power, because it takes us into worlds we can’t experience in any other way! Love and Hate are kindred siblings, that inspire, horrify, disgust, repulse, embrace, adore, caress, shame, tranquilize, frighten, seduce, amuse, threaten, and often surprise! We are always eager to attend THAT party!